Em's Craftwork and Quilting at Mount Colah: 'Automatic Continuous Clothing Closure', WHAT? At the exhibition, I have come across a couple of sewing related stories. One was about a zipper or a zip fastener. 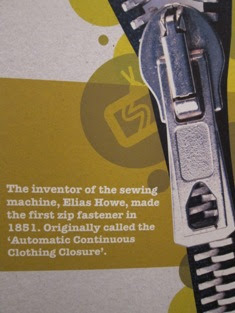 It was originally called the 'Automatic Continuous Clothing Closure', invented by Elias Howe, the inventor of the sewing machine. I'm definitely grateful for the more simple term; zipper, as I would have had some difficulties with referring to it, otherwise. ! 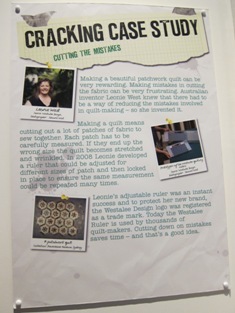 Another was a display on the invented quilting ruler by Leonie West. I'm one of her admirers and have got a few of the rulers. They have been very good to me with accurate cutting of the fabrics for my patchwork quilt tops. We also love Wallace & Grommitt and they come from Yorkshire which is where Keith was born. Looks like a great exhibit, thanks Emma. We also love Wallace and Grommitt as Yorkshire is where Keith was born. Looks like a great exhibit, thanks Emma.